Washington, DC – In a unanimous 9-0 decision, the Supreme Court ruled today that prison officials cannot arbitrarily ban peaceful religious practices, securing a landmark victory for religious freedom for all faiths. (see video here). In the case of Holt v. Hobbs, the Court ruled that Mr. Muhammad has the right to peacefully wear a half-inch beard in accordance with his Muslim faith after the State of Arkansas failed to show that it had a compelling interest in banning beards. 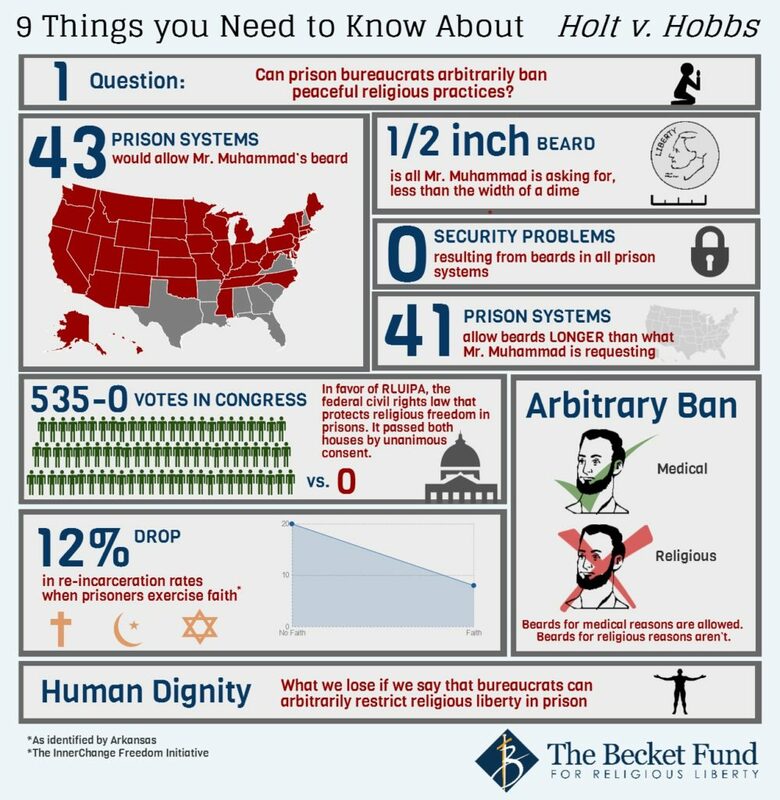 In light of the fact that more than 43 state, federal, and local prison systems allow beards, and because Arkansas has long allowed beards for medical reasons (see infographic), the Court held that Arkansas could not rely on mere assertions. The Supreme Court heard the case of Holt v. Hobbs on October 7. At issue was whether the Arkansas prison system’s refusal to allow the peaceful wearing of a half-inch beard violates a federal civil rights law, the Religious Land Use and Institutionalized Persons Act (RLUIPA). A broad range of groups supported Becket’s client, including the United States Government, the American Civil Liberties Union (ACLU), the U.S. Conference of Catholic Bishops, the Orthodox Union, Sikhs, Hindus and many other religious and civil rights groups. On June 28, 2011, Mr. Muhammad, representing himself, filed a lawsuit seeking the ability to wear a half-inch beard in accordance with his faith. After losing in federal trial court and in the Eighth Circuit Court of Appeals, he then submitted a handwritten petition for an injunction to the Supreme Court, which agreed to hear his appeal in full. Mr. Muhammad is represented in this case by Professor Douglas Laycock of the University of Virginia School of Law and Becket. This is a huge win for religious freedom and for all Americans. More than 43 prison systems across the country allow prisoners to grow a half-inch beard, and at least 41 prison systems would allow an even longer beard. What the Supreme Court said today was that government officials cannot impose arbitrary restrictions on religious liberty just because they think government knows best. This is a victory not just for one prisoner in Arkansas, but for every American who believes and wants the freedom to act on those beliefs.